A presentation by Pep Rosanes Creu, Bet Serra Aloy and the Associació Tapís, with a poetry reading by teenagers from the Tapís Association, and an exhibitions of illustrations from the book. Once upon a time, by Pep Rosanes-Creus, illustrated by Bet Serra Eloy, is the fourth book edited by the Associació Tapís as part of a project involving training schemes to encourage teenagers within the county of Osona in entering the workplace and the wider society. Tapís's books are printed on entirely hand-crafted recycled paper, and the teenage participants in this project performed each of the production tasks, from the elaboration of each sheet of paper, through to folding the covers, the binding and printing, all the way to the distribution of finished books for sale. The cover price of the books is wholely dedicated to the payment of the main part of a small wage-grant which participants receive during the training process, which includes acquiring good working habits, their basic training, training in social skills, and workplace orientation. 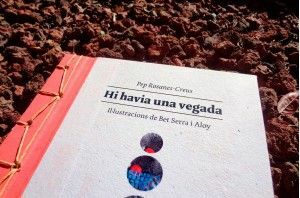 Pep Rosanes-Creus is an author with an extensive bibliography, including works such as: La venjança de l’eunuc (1993) and El gos i l’ombra de l’alzina (1995), Set (1998), No he fet res (1998), El cos del temps (1999), and Voltor (2000), with which he received the Carles Riba prize the previous year, La Rosa pòstuma (with Josep Casadesús K100) and L’illa del tresor (2008), for which he was awarded the XXXII Josep Maria López Picó de la Vila de Vallirana Poetry Prize. In 2015, Cants inespirituals – Obra pòstuma was published byEmboscall, an anthology of all his published works between 1975 and 2008. Bet Sierra Aloy is licenced in Fine Arts for the Faculty of Sant Jordi of Barcelona. Nowadays, she is a teacher of the School of Art and Design of La Garriga, EMAD. She curated and participated in individual and collective exhibitions of the region of Barcelona, Osona, Maresme and Girona. She participated artisticaly in leisure spaces from 1998 to 2003. She was selected in different painting and drawing awards like the Gaspar Camps of Igualada (2005), the Paco Merino of Granollers (2006 ), the Joan Vilanova of Manresa (2008 -2009 ) and the Miquel Viladrich of Torrelameu (2011). During the last years she is working with the concept of the artista book, participating in different exhibitions and fairs around the Catalonia and Canaries.